In any case, this post takes a quick look at how to use the explain plan facilities built into some common tools: Quest TOAD, Oracle SQL Developer and SQL Plus. Quest TOAD for Oracle is a common tool for both developers and DBAs. I think I have only worked at one place where it wasn’t the defacto tool for database development. Running explain plan in TOAD is a matter of entering the query in the editor and clicking the ambulance button on the tool bar or using the hot-key of Ctrl-E.
TOAD will display the query execution plan in the Explain Plan window, which will normally be underneath the query window. For the OLTP systems developer, TOAD will highlight in red any table scans it finds in the plan. This may or may not be a problem so don’t simply assume that anything in red is bad. However, it would be worth a closer examination to ensure it is an appropriate operation. TOADs default display of the execution plan will show the operations being performed and the objects being access all neatly indented so as to illustrate the dependency order. However, the default display is lacking critical pieces of information: the access and filter predicates. In order to enable the display of these other details, right-click on the execution plan window and select ‘Adjust Content’ from the context menu. Scroll to the bottom of the resulting pop-up window and check the boxes next to ‘Access Predicates’ and ‘Filter Predicates’ as shown below then click the OK button. 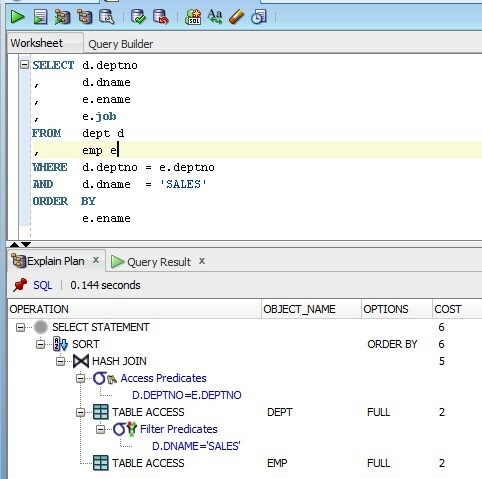 SQL Developer will display an Explain Plan window below the editor window, as shown below. Similar to TOAD, the query plan hierarchy is clearly visible in the display. Likewise, the child steps of any given level can easily be hidden, which is particularly useful for interpreting large plans. Right-clicking on the plan within SQL Developer displays a context menu that contains an option to export the plan to HTML. 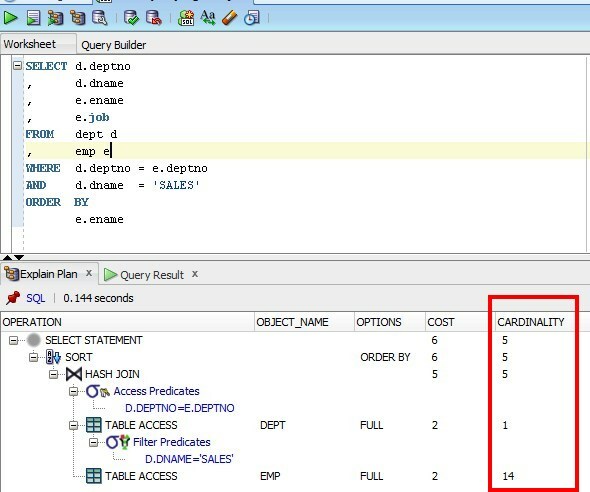 The default display for SQL Developer includes the access and filter predicates as well as the cost for each line but not the cardinality. To display the cardinality for each operation, select Preferences from the Tools menu. 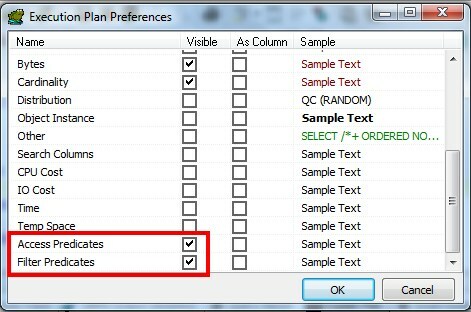 In the Preferences window, expand the Database selection on the left-hand listing and choose the Autotrace/Explain Plan option. 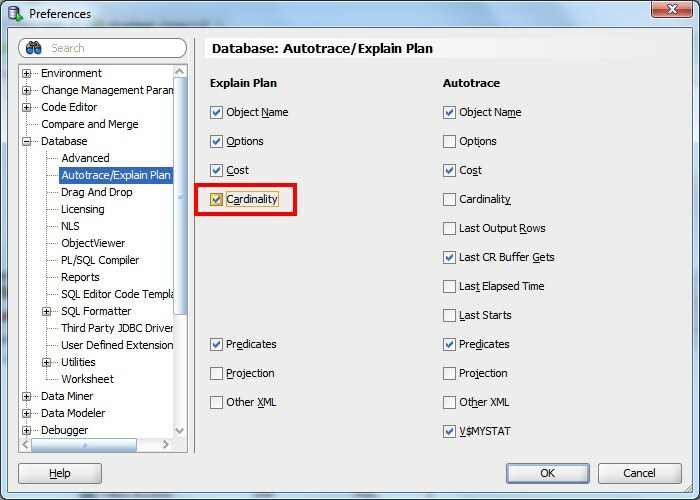 In the right-hand pane, under the Explain Plan options, check the Cardinality option as shown below. Once checked, generating an explain plan will display an extra column containing the cardinality. Perhaps not quite a pretty as the GUI tools but it’s quite understandable. The PLAN_HASH_VALUE is displayed near the top, which can be used to obtain details from various data dictionary views, including v$sql_plan. Within the table of plan details, the asterix (*) next to a line denotes that an entry exists in the subsequent Predicate Information section, which is where the specific access and filter predicates are listed. 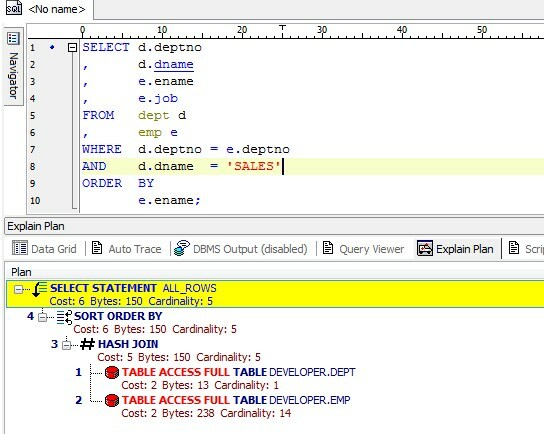 Note, the use of named parameters in SQL is a feature of Oracle 11. In earlier versions parameters to functions within SQL can only be passed by position. In all of the above it needs to be remembered that the plan displayed is Oracle’s best guess of what the plan will be when the query is actually executed. Generally speaking this will be accurate but certain features will cause Oracle to execute the query differently. I have previously noted bind variable peeking as a common cause for why the actual execution plan may differ from the plan described via the explan plan facility. To obtain the execution plan that was actually used when a query was executed you should use the dbms_xplan.display_cursor function, as described in the basic process monitoring post. In parting, running explain plan over a statement whilst in development is quite trivial and should be done for virtually every statement, even if it simply confirming an obvious plan. This entry was posted in Development, Oracle, SQL by Mark Hoxey. Bookmark the permalink. Yes, Toad products rock! Of course, I’m biased – I work here. I’m helping to make the content as solid as the product and it’s always so good to see users helping each other. There’s tons of content at ToadforOracle dot com.